If you're looking for an attractive way to protect your living area from an open flame in your fireplace, a mesh fireplace curtain is a great choice. At eFireplaceStore.com, we offer a wide variety of fireplace spark screen options. Woodfield and UniFlame are two other manufacturers that we feature on our website store. I am painting the brass on our wood burning fireplace black. I currently have it all off, and got to looking at the mesh side to side sliding fire screens. They are OK, but old. I once saw a wood burning fireplace with a pull down mesh screen. I don't know the make of our fireplace, but the opening (where the glass doors and metal screens go) is 36 inches wide and 20.5 inches between the tracks (or 21.5 to the top/bottom of the tracks). Is there some sort of after factory replacement pull down screen that I could install to replace the side to side sliding screens? I apologize, but we don't carry anything like that. I'm looking for a single panel black mesh curtain 19.5 inch tall and about 22 to 24 inches wide. Do you sell something close? Yes this Screen is 19.5" by 24"
the width of the opening is 36" x 28" high, does the 24" wide screen using 2 fit? The two 24" screens for a 36" opening is actually ideal for your application. Do you sell replacement mesh screens for the Majestic 42c firebox? Yes. you can find replacement Mesh Screens here. I would like to replace the existing mesh screen on the gas fireplace. The existing length of the screen measures 201/2 ". What size screen should I order? 20 or 21? In this case, we definitely think it better to have just a little bit extra (the "slack" will typically remain on the outer edges anyway) than to have an unattractive gap in the middle when the curtains are drawn. So we'd go with the 21-inch screens here. As we do not carry that brand, you will need to contact the manufacturer directly. We apologize, but we do not offer any fireplace screens in the sizes you have requested. Our full section is available as shown on this category page. How do you install the fireplace curtain or mesh screen? Here is a copy of the install instruction of the mesh curtain rod. How do I decide what width I need? You will want to go a total of 6"-12" over the full width of the fireplace to allow room for the screens to fold. How do I measure for these mesh fireplace screens? 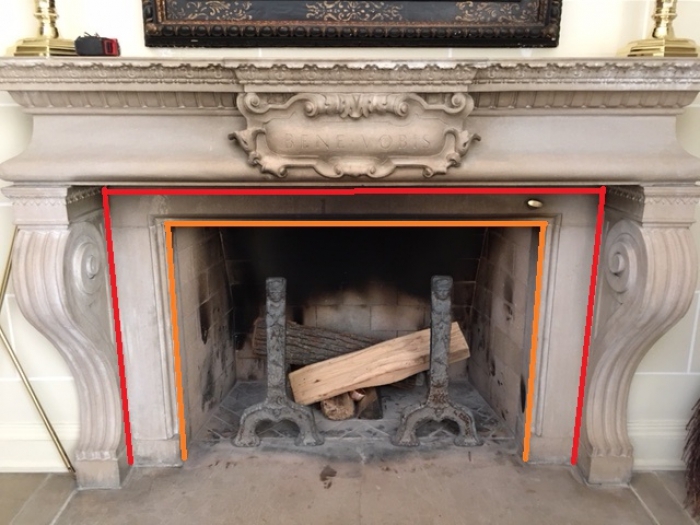 You will measure from the screen rod down to the floor of the fireplace, as you will need to determine the size of the top rings factored in with total height. Can your screens be trimmed at the bottom for a perfect fit? While the screens can technically be trimmed, it is recommended to purchase the correct height as standard, whenever possible. Cutting the screens will remove the bottom guide wire, which usually keeps the screens from getting bunched together or tangled. How do I replace a fireplace screen? 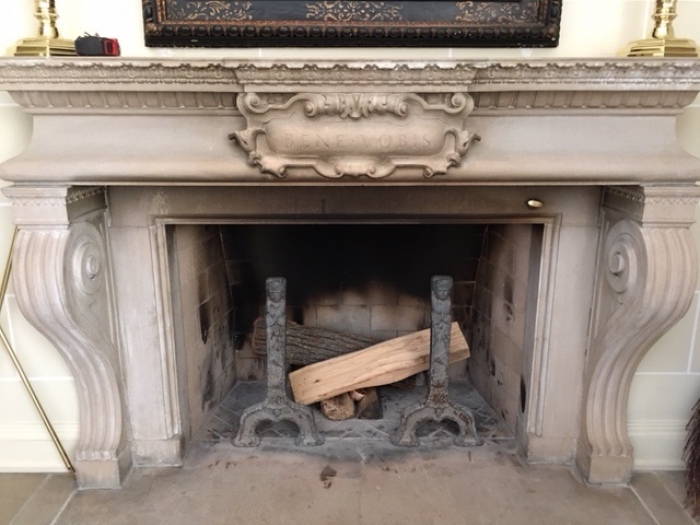 In almost all cases, there is a pair of support rods that run across the fireplace opening and are held in place by a center clamp. The center clamp is usually tightened down by a screw or pair of screws. By loosening the screws, you should be able to remove the screen rods and remove them from the fireplace. The old screens can then be slid off the rods and the new screens installed. The individual rods can then be reinstalled and the center clamp tightened down again. Do I measure from the top of the rod to the base to figure out the correct height for my new mesh screen? Also, how much clearance should I allow on the bottom? You do indeed want to measure from the top of the screen rod to the floor of the fireplace. You will need to subtract 1/2 an inch from the measurement to ensure proper clearance so that the screen does not drag. Fireplace screen curtains are typically made of metal fire screen mesh that is designed to keep sparks and burning pieces of debris from flying out of your fireplace. The mesh screens featured on this page are all designed to slide like a curtain across the front of your fireplace opening. They can be pushed to one side when you need to add more wood, but once the fire is burning well, you simply close the mesh curtain and enjoy both the light and the heat that your crackling fire produces! Mesh screens are fairly easy to clean-as long as you clean them on a regular basis. Typically, mild soap and a soft cloth are all your need to remove the dust and ashes that build up on the metal mesh. There's no need to use abrasive cleaners like bleach or ammonia, which can actually discolor the metal. However, a mesh fireplace curtain continues to be effective even if it starts to discolor. You may want to replace it for decorative sake, but it's still very effective at keeping debris inside your fireplace! At eFireplaceStore.com, we want to meet your expectations and keep you as a satisfied customer. That's why we offer a wide variety of products at very reasonable prices-especially if you shop during our sales events. And as an added bonus, you'll also enjoy free shipping with most of our items!